INMONARCH Mens Designer Wedding Turban pagari safa hat for groom TU2330 22-inch Red-cream by INMONARCH at SCRHI. Hurry! Limited time offer. Offer valid only while supplies last. 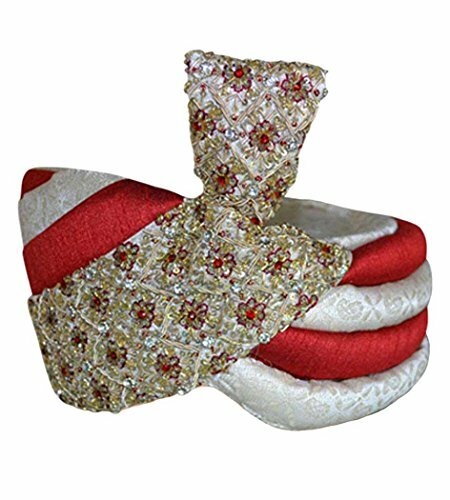 Designer red dupion and ethnic cream brocade fashionable wedding turban. This turban is made for weddings and other special festive occasions. Designer red dupion and ethnic cream brocade fashionable wedding turban. This turban is made for weddings and other special festive occasions. Handcrafted by the turban makers of Rajasthan, India. Dryclean only. Traditional wedding safa with stone work . Handcrafted by the turban makers of Rajasthan, India. Made from red dupion and ethnic cream brocade fabric. Dryclean only. Turban made for weddings and other special festive occasions.